Although we don't make it often enough, my husband and I are both huge duck fans. 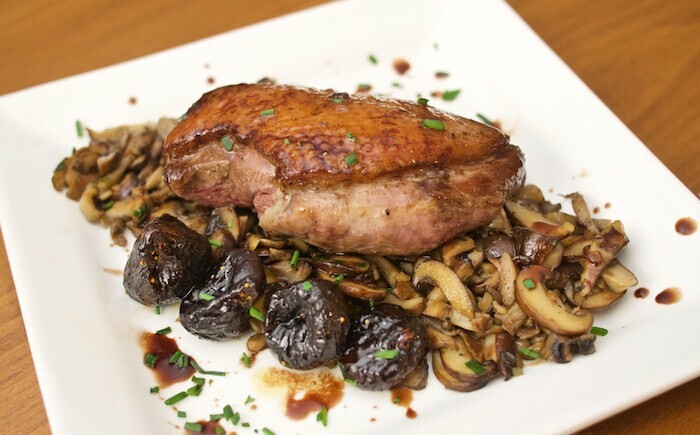 This recipe brings out the ducks natural flavors enhanced by the added earthy sweetness of mushrooms and figs. Give it a try! Preheat oven to 450°F. Melt butter in heavy large skillet over medium-high heat. Add shallots and sauté until translucent, about 4 minutes. Add mushrooms and ginger; sauté until mushrooms are tender, about 4 minutes. Add 1/4 cup water and simmer until most of liquid is evaporated, about 4 minutes. Stir in chives. Keep warm. Place remaining figs in small glass baking dish. Drizzle honey over figs. Bake until figs are tender and honey is slightly caramelized, about 12 minutes. Meanwhile, sprinkle duck breasts with salt and pepper. Melt 1 tablespoon butter with olive oil in heavy large skillet over medium heat. Add duck breasts, skin side down, and cook 5 minutes. Turn breasts over and continue cooking to desired doneness, about 3 minutes for medium-rare. Spoon mushrooms into center of each plate, dividing equally. Slice duck breasts and arrange atop mushrooms. Rewarm sauce and spoon over duck. Place 4 caramelized figs on each plate. It's been chilly here in Arizona this winter so I've been cooking a lot of comforting meals. 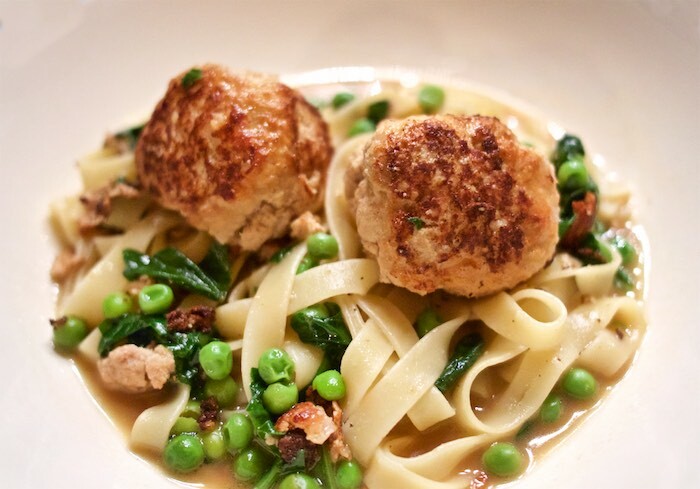 These moist ricotta & pork meatballs served with pasta, spinach and peas in a warm Parmesan broth are the perfect example. The best way to describe this dish is as giant open-faced ravioli. 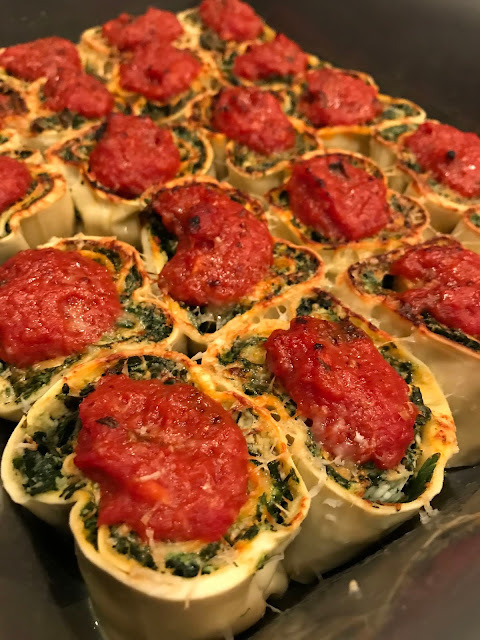 Rotolo is several thick sheets of pasta, spread with your favorite filling, and poached. This might seem a bit daunting at first but it really isn't that hard to make and the results are spectacular. Place the flour, eggs, egg yolks and olive oil into a food processor and process for one minute, or until the mixture comes together to form a dough. Turn the dough out into a bowl, cover and let rest 30 minutes. Divide dough into two equal pieces. Lightly flour each piece and pass through a pasta machine several times, gradually reducing the thickness, until you reach the thinnest setting and the pasta feels smooth and elastic. Set aside on a tray and cover with a slightly damp tea towel until ready to use. 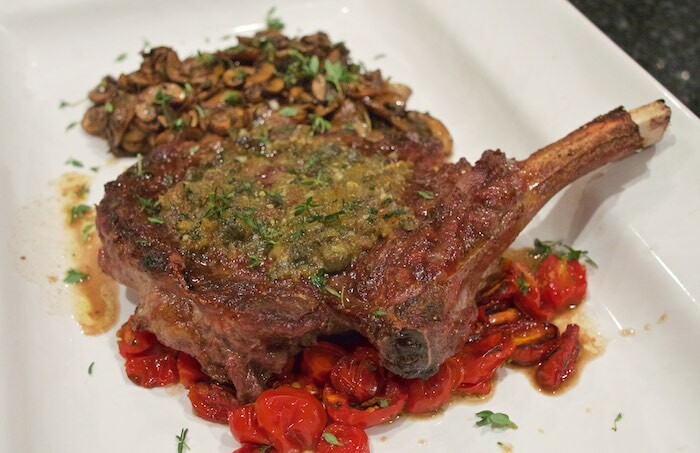 Heat the olive oil in a medium pan and gently saute garlic over a low heat for 2-3 minutes. Add the tomatoes and cook for 15-20 minutes, or until slightly thickened. Stir in the basil and mix well. Blanch the spinach in a pan of boiling water for 1-2 minutes, or until wilted. Drain well and squeeze out any excess moisture with your hands, then finely chop. Melt the butter in a medium pan until foaming, add the garlic and saute for 1-2 minutes. Add the oregano, chopped spinach and a pinch of nutmeg. Remove the pan from the heat and allow to cool. Mix the spinach with the ricotta cheese and set aside. Trim the pasta sheets into rectangles and place onto a large clean tea towel, overlapping them slightly to form one large rectangle (press the edges together to seal). Spread the spinach mixture over the pasta sheet, then roll up, using the tea towel to help wrap up the roll. Tie the ends of the towels with kitchen string. Bring a large pot of water to a boil, then reduce to a simmer. Place the rolled tea towel into the water and poach for 20 minutes. Remove and set aside to cool for a few minutes before unwrapping. Slice the rolls into pieces and place into an oiled casserole. Cover with the tomato sauce and sprinkle with the grated Parmesan. Broil for a few minutes, until the topping is golden-brown and bubbling. This is seriously one of the best vegetable side-dishes I've ever eaten. I stumbled across this delicious recipe, on Feasting at Home, while surfing the internet, late one night. I served it along side a juicy filet and it undoubtedly stole the show. Peel and slice parsnips to 1/8 thin. The thinner the slices the faster this will bake. Grate the cheese using a box grater. Generously grease a 9 x13 inch baking dish with butter. Layer the parsnips and onion with 2/3 of the cheese and 2/3 of the thyme -saving the rest for the top- and reserving the more perfect pieces of parsnips for the final top layer. Press down and make sure layers are even. It’s OK if the inside layers are messy. Place the last layer of parsnip slices in nice looking overlapping rows. In a small pot, heat 3 Cups heavy whipping cream. 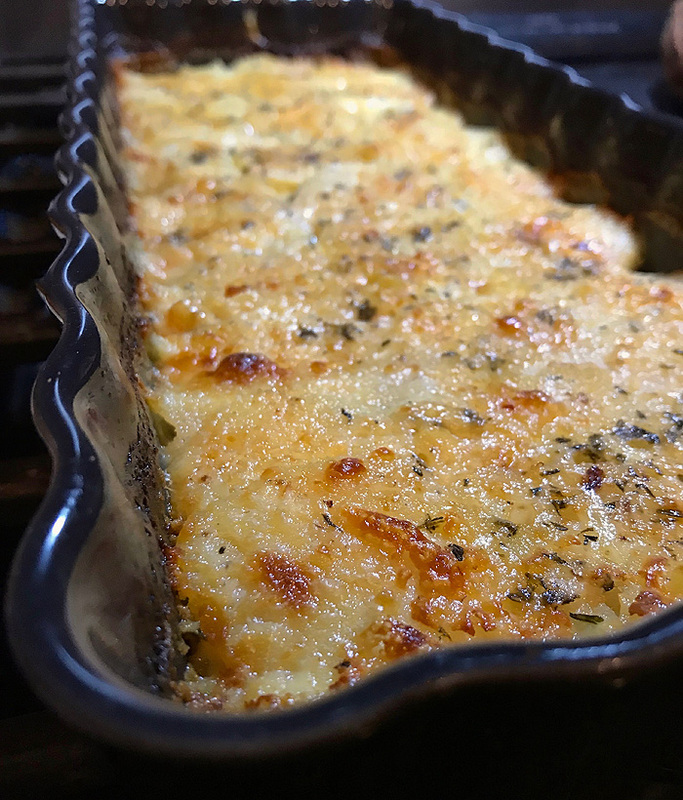 Whisk in salt, nutmeg, the remaining thyme, pepper, flour and the garlic and when it just comes to a simmer, pour over the layered parsnips, slanting the baking dish to get the cream in all the nooks and crannies. Sprinkle the remaining cheese over the top, a few more leaves of thyme and a little sprinkling of nutmeg. Cover securely with a lid or foil and bake for 50-60 minutes on the middle rack until parsnips are fork tender. Once fork tender, remove foil and bake another 15 minutes uncovered , or until golden and bubbly. It is important to let it sit at room temp for 15-20 minutes before serving, so it sets up and thickens.